Can you Spot the Reverend boy? To our big disappointment, the New York State Senate voted against the Marriage Equality bill yesterday. 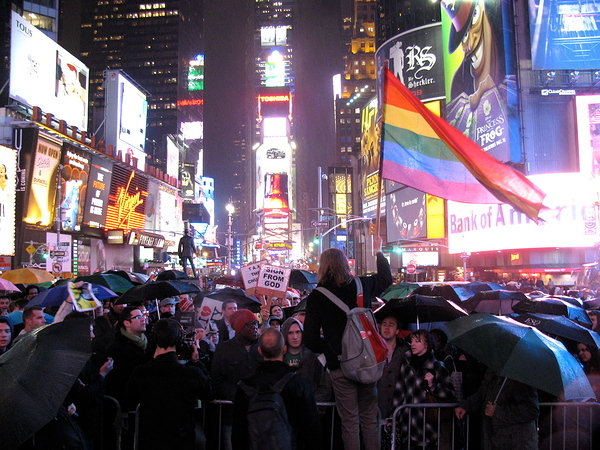 A protest was organized in short order in Times Square that evening, which I went to. It was chilly and rainy but we had a decent turnout for two hours notice. The Manhattan Borough President, Scott Stringer said a few words towards the end. I’m the guy kind of center – left directly behind the fellow in the red knit capt and just to the left of the guy holding the “Sign from God” sign. Black coat, blue shirt.